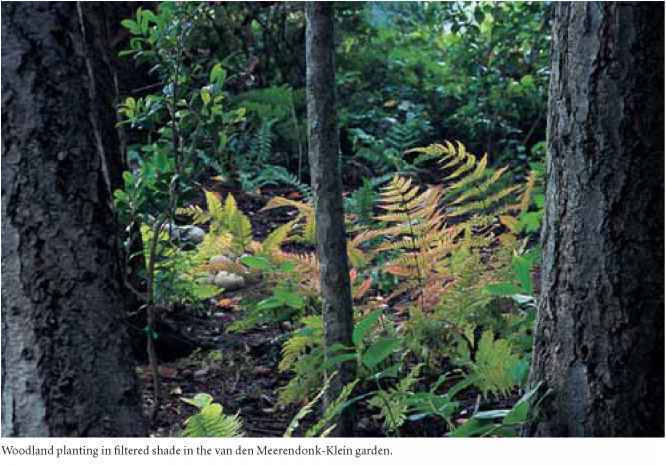 In the woodland garden, ferns enjoy a site with filtered light shade and soil1 (not to be called dirt) enriched with compost, humus, or the well-draining leaf mold associated with the undisturbed forest floor. Most species appreciate and thrive in acid soil that fortuitously occurs naturally under a canopy of conifers with their annual top-dressing droppings of lightweight needles. '"Don't Treat Your Soil Like Dirt—'Free dirt'. Signs proclaim availability, but have you ever seen a sign offering 'Free Soil'? Of course dirt is free. Anyone who's ever cleaned a house or tidied an old garage knows that dirt costs nothing and arrives unbidden Dirt may be composed of intriguing components such as old spider webs, insect detritus, dog hair, and sweater lint, but it is never desired. 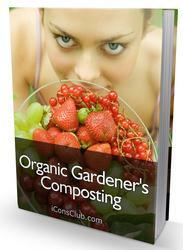 Gardeners crave and covet soil. The fragrance of a turned-over shovelful of soil in early spring thrills the winter-bound soul. Soil-complex ... has mineral, organic, and living elements combined [and] for gardeners and lovers of tame and wild nature, it is soil not dirt in which all terrestrial life is ultimately rooted" (Kruckeberg and Robson 1999). 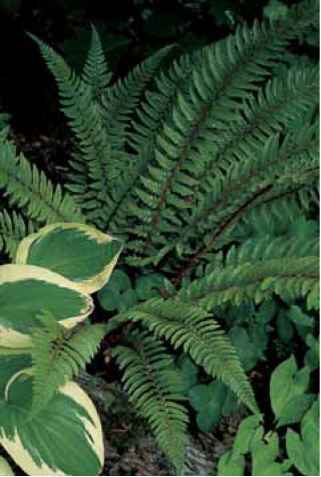 The evergreen Polystichum neolobatum is a reliable and ornamental addition to temperate gardens. Blechnum discolor along a woodland track in New Zealand. raised beds (while not burying trunks of trees or shrubs) than to try to conquer the clay. The outmoded recommendation to dig a hole and fill it with good soil cost many plants their lives. 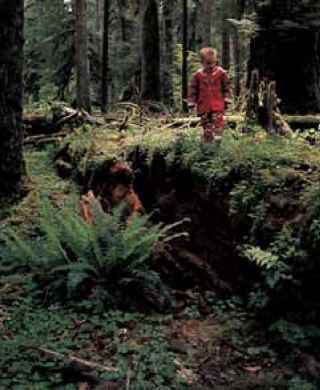 Roots are unable to expand into the clay from such a planting site which will, however, attract all of the drainage from the surrounding clay and quickly turn to suffocating muck. Mother Nature provides an ideal setting with a natural mulch under conifers in the Olympic National Park, Washington. the temperature by adding a blanket of protection to the plants, increasing their cold tolerance. By contrast, in the summer it keeps the bed cool, reducing evaporation and the need for supplemental water. Aged compost is an ideal additive, but leaves do splendidly as well. Oak leaves (shredded if need be) are excellent as they are acid in content, do not form an impervious mat, and break down slowly. In my garden, Japanese maples dominate the landscape and annually fill the garden with their fall litter. Before the emergence of spring growth I remove their deposits from the crowns of the ferns, but otherwise the leaves are left to compost at will. Conifer needles are another outstanding lightweight acid-yielding top dressing. Bark, meanwhile, is best left as a surface material for paths rather than mulch, unless it is obtained as aged compost. Then regarding mulch, there is the "Olsen compromise" which is related to fern grooming. I have always preferred to leave the fronds on ferns for the purpose of replenishing the underlying soil. However, my late husband preferred the tidy look of groomed plants so we trimmed the fronds, ran them through a shredder, and returned them as mulch. Trimming and grooming have both scientific and aesthetic considerations. Deciduous ferns are self-grooming, but the evergreens are not so inclined. Their fronds not only decorate the garden throughout the winter but also continue to produce food for the plant and protect the crown from the ravages of winter cold. Any shearing should be done in the spring. The least backbreaking and least labor-intensive system is to take the fronds off in bunches before the new foliage unfurls. For the maximum health benefit to the plant the best option is to leave fronds on until after the new growth has expanded. The extra boost of nutrition will create larger plants (which, however, if they are to be trimmed will need to be done individually, frond by frond . .. a great project for restless children). Much of the decision is determined by the number of ferns in the garden. What we are able to cultivate is decidedly influenced by our climatic zone, usually governed by low winter temperatures, but many plants will grow in some parts of a hardiness zone but not in another part of the same zone. The explanation is an ongoing science, but several factors need to be considered. One is the length and temperature of the growing season. Short and/or cool growing seasons will not allow a plant to produce as much life-sustaining sugar as longer and warmer seasons. The more sugar, the better prepared a fern is to withstand winter cold. Another contributing factor is the timing of late frosts in the spring. There is always an "exceptionally" late or early year, but repeated late frosts will in time take a toll on early emerging plants, reducing their vigor and sometimes killing them. Some garden centers sell a lightweight gauze that can be draped over sensitive plants when freezing temperatures are predicted. I have found this useful even in the middle of winter when exceptional cold is expected. Impromptu solutions include tossing a pillowcase over vulnerable plants (not just ferns). One year when we had a severe and extended cold spell my entire neighborhood had plants covered with all manner of sheets and assorted coverings. It looked as if we were having a huge winter white sale. Hot summer weather presents its own set of challenges—drought, in a word, being one. Dry plants are more vulnerable to damage and foliar loss. Again mulch is extremely beneficial, but watering is also necessary, and once the soil is dry it takes longer to rehydrate. I do stress my plants, however, forcing them to reach their roots down for water and reduce the need for supplemental sprinkling. Some areas of my garden, never get watered and have adapted to the neglect. Of course, that is not where I locate my prize specimens. Watering early in the morning cools the soil surface at least temporarily and more water reaches the roots rather than evaporating in the heat. Water infrequently but deeply and try to keep water off the foliage during daylight hours so that the magnified sun's rays do not scorch the plant. Deciduous trees such as oaks, dogwoods, Japanese maples, birches, and shagbark hickories all provide a lightweight canopy that encourages good health in the fern community. Those with creeping surface roots such as cherries are manageable but will greedily absorb moisture and nourishment. Beware also of beeches, native maples, walnuts, and all trees with invasive roots. While conifers clearly offer shade (which can sometimes be too dense) and beauty and create their own light mulch, beware of their ever-thirsty roots. Supplemental watering keeps both tree and fern happy, although with cedar trees even extra water will not be of much help. Preferences for planting times vary. Fall is recommended in the Pacific Northwest and spring is preferred by many East Coast gardeners. However, ferns can be planted whenever the garden soil is workable, meaning soft but not soggy. Warm soil temperatures at any time encourage root growth thus giving the plant a head start. However, with spring or summer planting the first summer requires extra attention to watering while the plant gets established. Another increasingly common transplanting issue involves polystichums that over the years may form pseudo-trunklike bases. 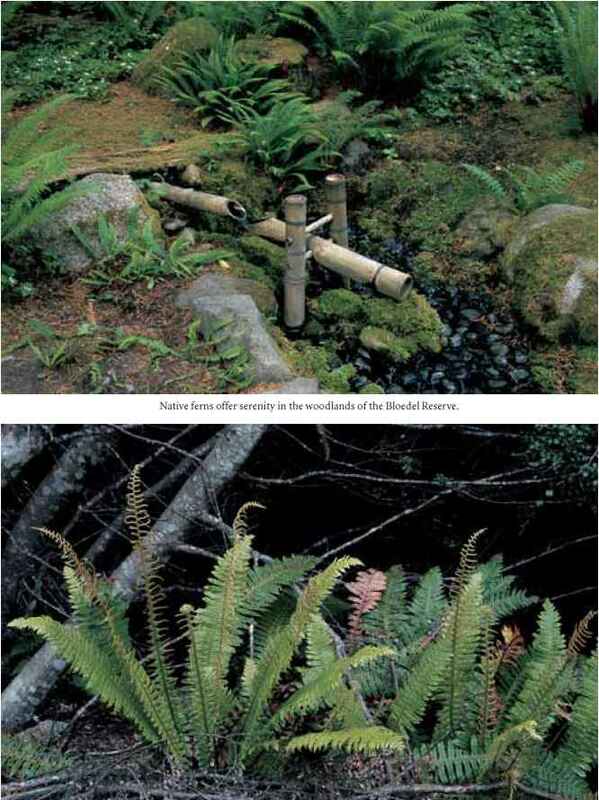 This problem occurs with a number of the Japanese species that are ornamental but are not to be confused with tree ferns. As the old fronds drop, the new growth emerges from above the stipe stubs so that eventually the crown is well above the soil. These ferns are weakened and for optimum health should be replanted so the crowns are reestablished at soil level. Or, while less aesthetic, soil can be mounded up to protect the frond base. Otherwise, the plant gradually loses vigor and is likely to be short-lived. 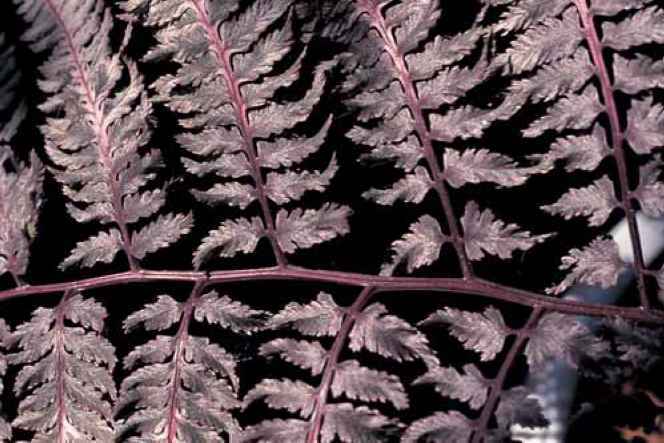 Ferns may be without flowers, but in their own special way many of them do have color. Lives there a gardener who does not find joy and inspiration as the garden awakens in springtime? Hepaticas, daffodils, primroses, and rhodies, usually in that order, bring life to the garden as well as the gardener. Foliage, while more subtle, enriches the springtime composition as well. And what are ferns but foliage? Fern lovers take delight in the unfurling new fronds that invite inspection and appreciation. Sturdy Polystichum crosiers emerge cloaked in coats of silver scales offering the garden design an especially striking duet in combined plantings with the matching whitish new foliage on indumentum-clad rhododendrons. Decorative silvery spring crosiers of Polystichum. 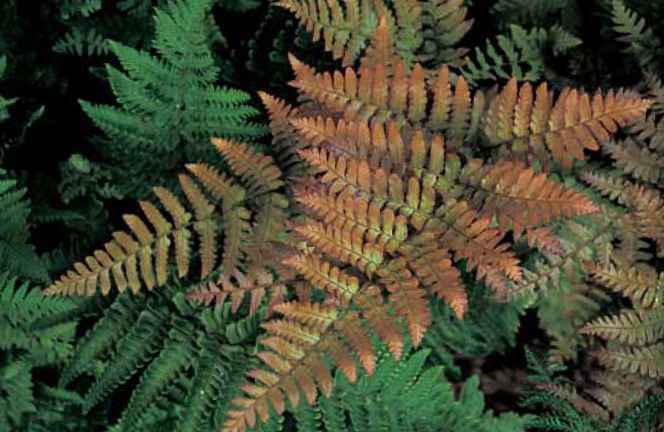 Rosy spring color on the autumn fern, Dryopteris erythrosora. fern) with vibrant yellow to orange fronds accented by dark scales. 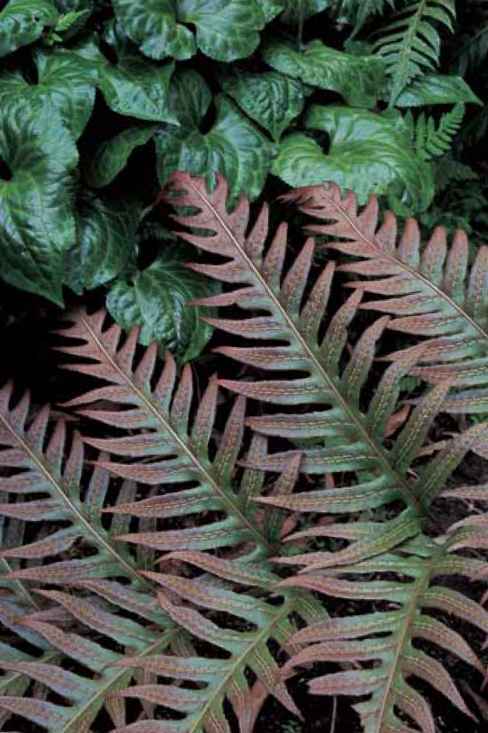 The lower-growing, 2-ft. (60-cm) D. lepidopoda (sunset fern) displays satiny, warm coral-colored spring foliage, while D. erythrosora, the popular autumn fern and its cultivars, unfurl in a rosy copper frost that in time fades to rich green. Dryopteris koidzumiana, new in cultivation, has saturated, velvety russet new growth. The sturdy little Blechnum penna-marina, an 8-in. (20-cm) creeper, has red new growth as well. 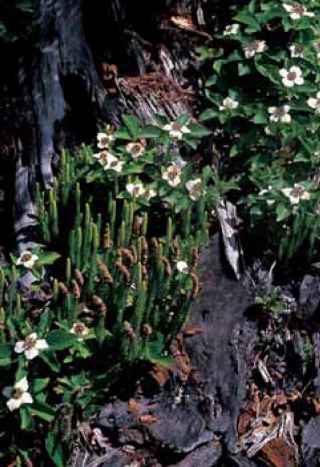 It is especially pronounced when planted in the sun where it will display the compact fronds typically seen in its alpine homelands of Chile and New Zealand. For this species, shade encourages rangy growth. On a larger scale new growth on several woodwardias and a number of the taller New Zealand blechnums is suffused with blood-red vibrancy. The best of the woodwardias (Woodwardia unigemmata and W. orientalis var. formosana) may be on the tender side but are unfailingly ornamental. Give them affectionate care which includes protective attention in the depths of the bleak midwinter. All of the above are evergreens and join with other colorful individuals described in the text. The red-saturated new growth of Woodwardia unigemmata in complimentary tandem with the polished green of Beesia deltophylla in the Duryee garden. statement when grouped together. (For additional impact add a plant or two of Brun-nera macrophylla'Looking Glass' or 'Jack Frost' to the composition.) While less flamboyant, the matte fronds on Athyrium otophorum (eared lady fern) bring a refreshing combination of lime foliage suffused with plum highlights. Athyrium yokoscense with its understated silver foliage adds a welcome quiet touch when centered among brilliant companions. Silvers and pinks enhance the frond of Athyrium niponicum 'Pictum'. 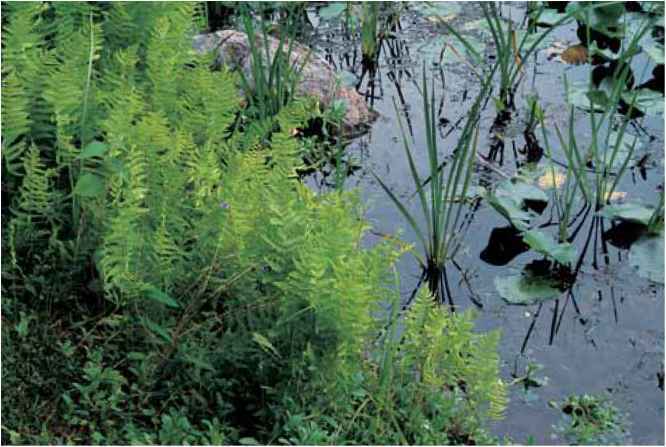 In general, pests are not a threat to ferns. Slugs and snails, never ones to miss a treat, occasionally chainsaw new spring growth, so precautions should be out early in the season. Bait should be broadcast about rather than positioned as a dinner bell adjacent to a vulnerable plant. Improved baits include several that remain potent after being wet and do not affect bird populations. Traps with assorted lures, including beer and coffee grounds, are efficient, but not particularly attractive to clean. Aphids will land periodically and are more dangerous for their tendency to spread diseases than for eating foliage. Leafhoppers (arriving in 1998 in Washington State) appear on selected species and cultivars and can disfigure foliage, especially of the assorted and plentiful Dryopteris cultivars. These pests can be restrained, but so far not controlled, with the judicious application of a systemic insecticide. Oil-based sprays suffocate ferns and should never be used near them. I have also had poor luck with soap-based remedies. Light applications of other commercial products, especially those containing resmethrin have not harmed my ferns. All chemicals should be used with caution and tested on a nonvaluable plant (bracken perhaps) before applying them to anything special. Finally, I recommend limiting the application to the infected plant rather than spraying the entire garden to clean a few plants of their bugs, but then I am one who would rather not spray at all. 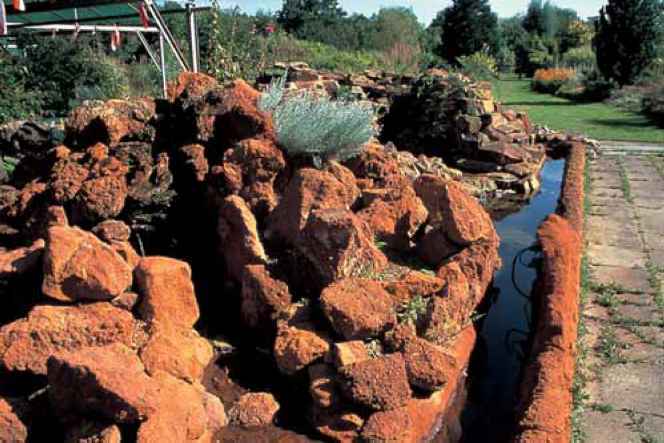 A moat, the ultimate weapon against the ever-present threat of slugs, protects select plantings in the Gassner garden. Photo by Richie Steffen, Miller Botanical Garden. ever they will eat whatever necessary to stay alive and, in spite of many imaginative repellent concoctions, will only avoid gardens when fenced out by a barrier at least 6 ft. (2 m) tall. Rabbits, meanwhile, consider the fern garden their personal salad bar and can and will demolish a collection over night. Given these basics, most of the temperate ferns described in this book should provide years of beauty in the woodland. An exception must be made for ornate cultivars, however. I am talking about varieties with epithets such as cristatum (crested), capi-tatum (with a head or large crest), ramosum (branched), ramo-cristatum, and grandi-ceps (with a large terminal crest). These are the soloists of the crowd. Far be it from them to harmonize in the woodland chorus. Treat them as specimen plants, placing them center stage if you choose or in a featured pot somewhere. Once upon a time, a very long time ago, I considered my ferns to be companion plants for my rhododendrons. Now, of course, the rhododendrons are the companion plants for my ferns. With their similar cultural requirements, they do indeed complement each other. There are many other options for the woodland floor, however, and here are some of my favorites. Helleborus niger and H. orientalis and their hybrids contrast splendidly with ferny foliage and in my garden offer a floral bouquet from early winter through spring. Helleborus orientalis hybrids come in many colors and new strains, including some with double flowers that are the focus of current breeding programs. They need an annual grooming but are evergreen and easy. 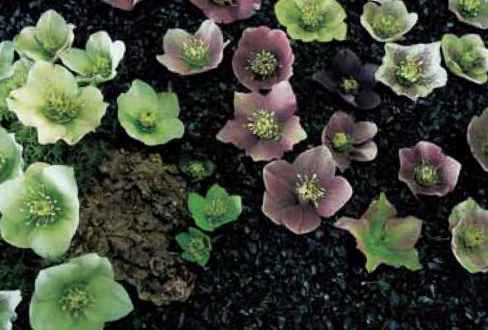 Varied colors of hybrid hellebore floral offerings liven the winter garden. Hostas with their varied and sometimes bold leaves are favorites and make outstanding foils for the delicate tracery of fern foliage. They have compatible soil, shade, and moisture requirements and range in size from miniatures to giants. Unfortunately they have a tendency to attract slugs (so do not plant them near your aspleni-ums), but new strains are likely to be more resistant. Heucheras, available in ever-increasing abundance, attract hummingbirds with their flowers while providing interesting foliar patterns. Unusual color combinations feature silvers and burgundies with assorted shades of green. Most heucheras require strong light for a healthy appearance. Athyrium niponicum 'Pictum' (Japanese painted fern) is stunning when planted with some of the shiny deep black-red cultivars, such as Heuchera obsidian. Hosta sieboldiana 'Elegans' offers a bold contrast to the lacy architecture of ferns. A bouquet of Adiantum venustum and Cyclamen hederifolium in the fall garden. an added interest in the shade and do not challenge ferns for territory. They look best when embraced in foliage, however. A solitary plant is a lonely plant indeed. Regardless of how and how often they are planted, many of mine have a disconcerting tendency to turn their backs on their audience the following spring. 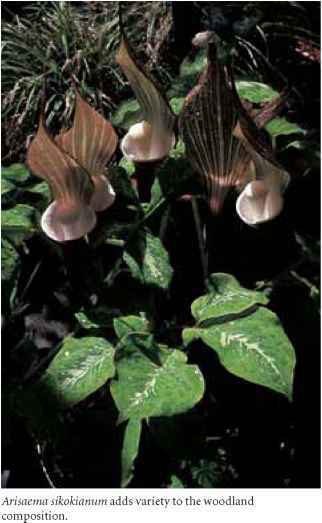 Arisaema sikokianum, one of my favorites, consistently hides its loveliness in this manner. I now have mine planted in pots which I can locate so that their features face the footpath rather than the backside of the carport. Asarums, likewise not common but increasing in popularity and surely attractive, have rather weird flowers bashfully concealed under the foliage and make excellent foliar and noncompetitive contributions to the woodland. Some of the best are Asarum canadensis, A. europeanum, A. speciosum (synonym Hexastylis speciosa), and A. splendens. Newly imported material, especially from Japan, has tremendous horticultural potential. Hardy cyclamen are durable and doable for late-summer and winter interest. 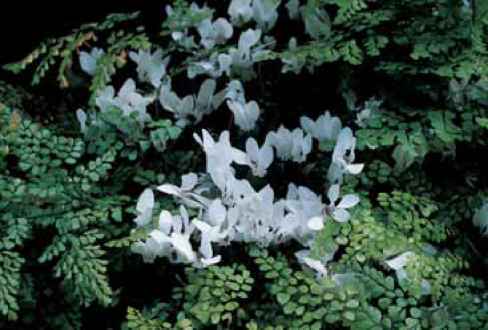 Specifically, Cyclamen hederifolium will bloom for months and provide ground covering interest throughout the winter. It deserves and receives much praise. 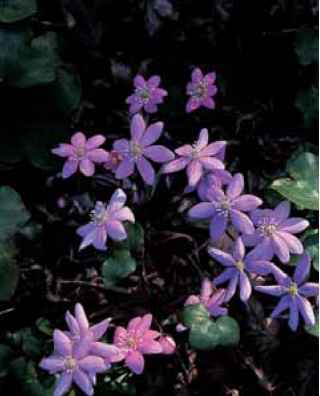 The welcome faces of diminutive hepaticas bring the promise of spring. A woodland fern community, including Lycopodium, and its charming companion creeping dogwood (Cornus canadensis) on a mountain slope in Canada. all of which are evergreen with many prostrate (or nearly so) and very choice. Choose, depending on your climate, from Gaultheriaprocumbens, G. nummularioides, G. sinensis, and G. shallon among others. Most of the above, with the exception of the last three gaultherias are suitable for Zone 5 and up. I hope the reader has noticed that several well-known garden plants are missing from this list (deliberately). Among them the worst offender is ivy, Hedera, in its many invasive manifestations. English ivy (H. helix) will choke trees, not to mention overrun the choicest ferns, and is listed as an invasive weed in many regions. Euonymus fortunei, especially var. coloratus, can be just as overpowering, taking years of labor to eradicate once established. Popular ground covers including Pachysandra, Ajuga, Vinca, and Ox-alis can smother delicate fern plantings. Unpopular ground covers also cause problems and some such as the western U.S. native Maianthemum dilatatum take on a life of their own, even when challenged by herbicides. Make your life easy and keep these out of the garden in the first place.